For religious occasions or any event where you want to add a memento that's fits for a king or queen, this elegant frame is a spirited choice. 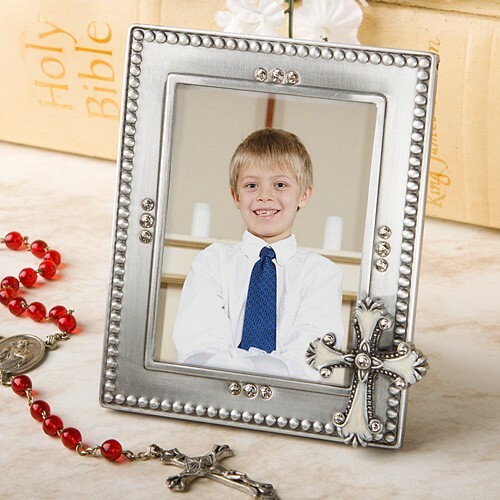 The pewter-finish metal frame measures 4.5" x 3.5" and features a beaded border, glistening rhinestone accents and a dramatic cross shaped pewter colored poly-finish-accented ivory inlaid enamel charm in the lower corner. At the frame's center is a 2.5" x 3.25" glass window with a hinged slot for easy insertion of a photo or event day place card and a black felt easel stand back. 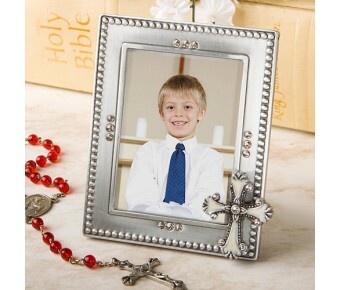 From Fashioncraft's exclusive Regal Favor Collection, each cross frame comes, with a cross decorated "For You" message showing through the window, in a white box with a blank vertical place card included.